A friend offered to drive me home in his car today. We were on the PIE (Pan Island Expressway) and we noticed something. We saw a cyclist! 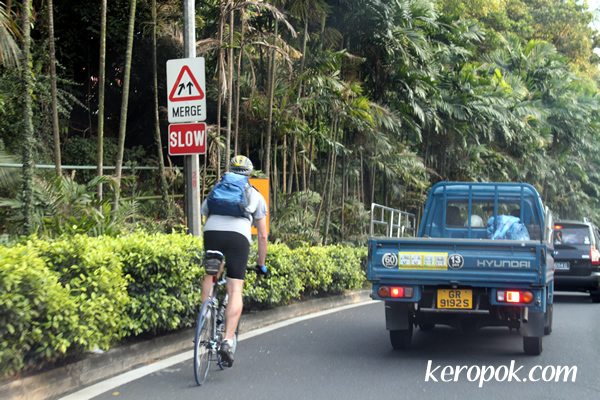 It's not that Singapore has so few cyclist that when we noticed one, we got surprised! 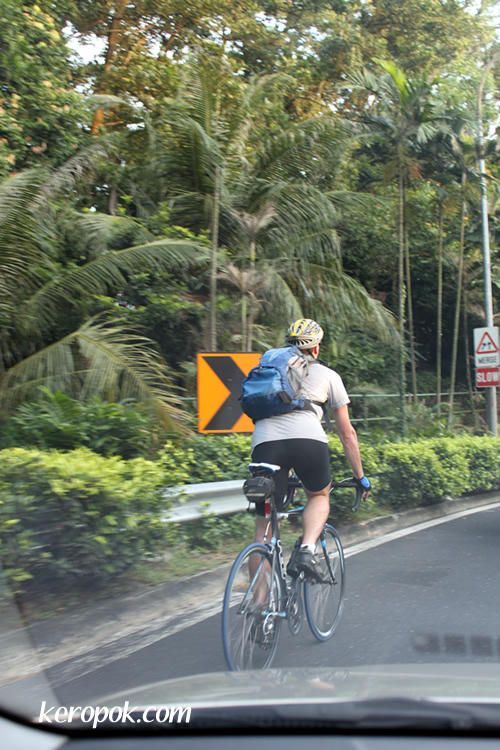 We were surprised because this cyclist probably is a new resident in Singapore and does not know that cyclist and pedestrians are not allowed on expressways in Singapore. Dear cyclist in the photo, please don't be the black sheep and get on the expressway just because you want to get home quicker. There are alternative routes. I have colleagues who cycle to and from work. They do not want people to think cyclist are irresponsible and law breakers. You get the hint. When you get a chance, I'll take you biking here in the San Francisco Bay Area. Cyclists are considered part of the normal flow of traffic here, and there's none of this "lawbreakers" view. Singapore is a small country which also happens to be quite flat, and the reality is that if the laws were different, it would be a very bikeable place. For example, add a 1m wide bike lane on the left. I bet you'll see a LOT of people move out of their cars, thereby actually *increasing* the speed of traffic. My cyclist colleagues says that to add a lane, we might have to wait a very very very long time!